Let Matt and his team of professionals go to work for you today! 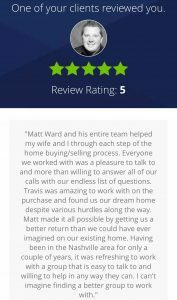 Our Realtor, Travis Tuley, with the Matt Ward group gave us a high level of professionalism, a thorough knowledge of the local market and great responsiveness. We had our offer signed and accepted by the seller before the next 7 offers came in! We can’t image calling anyone else for our next home venture. It gives me great honor to express my complete gratitude to the Matt Ward team. Sam Nienow has been exceptional with this process. Our family has been notified every step of the way without fail. I will make sure to share Matt Ward with family and friends and look forward to doing business in the future.